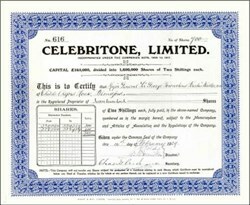 Beautifully engraved certificate from the Celebritone, Limited issued in 1929. This item is hand signed by the Company’s Directors and Secretary and is over 72 years old. The certificate was issued to Major General Sir George Townshend Forestier Walker.